Continuing in the footsteps of one of the hottest lines of Box Mods currently in circulation today and with a further increase in output power. demand from today’s sub ohm vapers and in some style! The iStick range from ISmoka has created a large footprint in the world of VV/VW devices, and judging by the steady increase in models from the company to include the widest variety of possible options to cater for vapours requirements it will continue to do so for some time to come. The iStick ranges popularity here in the UK, as I’m sure it is around the world has become one of the most talked about products in 2015. Seen in vaping bars outside pubs clubs and restaurants this latest edition will probably become a must have vaping accessory as well, so clearly I have been looking to see what the new 50w version has to offer you the consumer and give a clear insight as to what you can expect from this device and how it performed during testing, in my opinion. A point I would like to mention here is that I do not get paid for reviewing products sent to me from the various E-cigarette manufacturers, and always give you an honest opinion on each products performance. Neither do I criticise products sent to me here for review but instead offer constructive suggestions that may help in the design of future builds (in my opinion) for the benefit of the vaping community as a whole. Any potential faults that I find are always relayed to the manufacturer at the earliest opportunity in order to give them the chance to rectify them prior to public release, provided they are sent to me in time to do so. The iStick 50w has been sent directly to me for review from ELeaf UK. Housed in a shrink-wrapped cardboard casing with a picture of the device itself on the top cover, the picture being larger in size than the actual unit to be found inside by close to an inch in length and one-half inch in width makes it all the more remarkable when you consider the huge battery life it contains in such a small device. With a choice of four different colours to choose from including Black, Silver, Blue and Red, the iStick 50w caters for a wide selection of tastes so be sure to check you have the correct colour prior to purchasing your device and opening it. Also please check the warranty period should any be included with the iStick 50w prior to purchase as well. This may differ depending on your location. 1x Eleaf IStick 50W unit 1x USB charging cable 1x Wall Charging Adaptor 1x eGo Threading Adaptor and finally your included user manual. Please note that some countries may not contain a charging adaptor. The rear contains a product overview including features, along with an age and health warning, so please read this carefully prior to the purchase of your device. There is also an authenticity sticker with a barcode along with the company safety standard logos and recommended means of disposal – not for some time I hope! Please also check with your store or any online purchases the warranty period offered with this device prior to purchase. Below is a list of the iStick 50w’s features including the colour options. Temperature Safety Alarm With Automatic Shutoff. Colours: Black, Sliver, Blue, and Pink. Temperature Safety Alarm function: If the temperature of the device is over 70℃, the output will shut off automatically and the screen will show “Temp Protection” for a period of 5 seconds. Stainless Steel spring-loaded connector pin (Brass on mine) & threading: The spring connection base ensures its high adaptability. The connecting thread is made of stainless steel making it all the more durable. Two air channels are cut into the chromed finished stainless steel top deck at the front of the device just above the Power/Fire button. ELeaf has introduced four coloured silicon covers for the release of the iStick 50W in Black, White, Hot pink, and blue. They are soft and elasticized to fit closely with the battery. You can use them to protect your device from external abrasions. Now, it’s time to dress your favourite device up a little with that added protection! These covers are supplied separately and at an additional cost. There is also a version in leather as well with an attachable carry strap making it that much easier to transport your device while on the move. For the purpose of conducting this review, I have used a selection of two different E-juices with varying PG/VG combinations from G2 Vapor and the Longhorn Vapor collection. 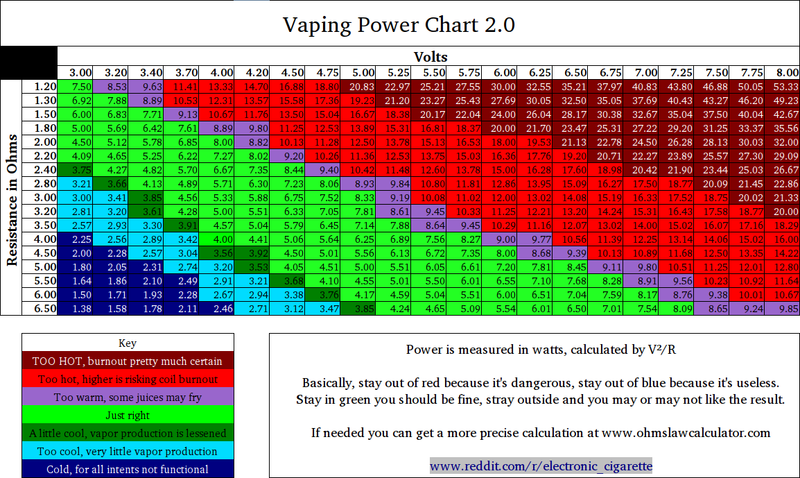 Using the ranges supplied in this chart for overall consistency, I have tested the iStick 50w’s full range from 5w up to the maximum of 50w’s using the KangerTech Subtank Hybrid Organic Cotton Coil along with the Kayfun Lite to conduct a comprehensive and thorough test of the device. There have been recent reports of the device auto firing although I have not experienced this personally. So, always make sure you purchase your device from an authorized Eleaf vendor, and should you encounter any problems at all contact them immediately. Good products always seem to get cloned first! I have been using the iStick 50w continually to test the functionality of this device as thoroughly as possible so as to gauge its overall performance for you. The operation of the IStick 50w is as simplistic as its design. To turn the iStick 50w battery either On or Off just press the power/fire button five times, and your screen will display the device’s current settings that were set initially to 50w on my device, five may be a better starting point! When powered on if you press the fire button without an atomizer attached the display will show you the error message No Atomizer. The OLED screen displays the current battery status on the left-hand side of the screen and next to this at the top the resistance of the attached atomizer. When no atomizer is attached, you will see a value of 0 represented. Below this you will be either the VV current setting or the VW current setting that alternates depending on which mode you have the device selected to. To the right of both of these displayed in a larger value size is the current mode of operation the device is set to. To set your desired mode of operation, be it in VV or VW modes, press the power/fire three times in quick succession to select which one suits you best. When set to variable voltage mode it will allow you to adjust the voltage range between 2.0volts & 10.0volts in increments of 0.1 by using the up< and down> keys situated on the upper front side of the device. Alternatively, in the variable wattage mode you can adjust the wattage values between 5 watts all the way up to 50 watts in increments of 0.1 also. By holding down either the up arrow or the down arrow, you will activate the fast scroll option allowing you to reach your desired setting more quickly. The iStick 50w does not permit you to round robin and stops at both its minimum and maximum settings. Once you have set your chosen vaping value, you can activate the lock function on the device which will stop accidental changes of your set wattage or voltage from occurring. Please be aware that in the lock function mode the device will still fire if the fire button is pressed. Activation of the lock function requires you to hold down both the Up< & Down> arrows simultaneously for a duration of two seconds to turn it on or off. Also included is an option to change the orientation of the display by 180 degrees to suit your personal viewing preference. To change the viewing angle of the screen first switch off the power, press and hold the hold down both the Up< & Down> arrows simultaneously for a duration of three seconds and look again at the display window to see the change occur. You can change it back again by performing the same function. There is also a Temp control function that can be displayed by pressing the power on switch five times and five times again in quick succession which I cannot find in the user manual, so I’m a little unsure why it is there? A temperature alarm is included and should the device reach a temperature above 70 degrees Celsius the power off will shut the automatically for a duration of 5 seconds. The error message Temp Protection will be displayed and will allow you to continue vaping after this timeout period has finished which is a useful safety measure to include given the increased power output of this device. To charge your device use the included mini USB adaptor that you can find inside the box. Connect it to the mini USB port situated on the back centre and to the top and connect to a suitable power source. You have the option to vape while charging so bear this in mind as a full charge can take up to five hours! Constructed from aluminium with a stainless steel top and base the iStick 50w is both strong and lightweight in a size and fits into even small hand sizes without producing any discomfort at all. Performance has been nothing short of excellent with long lasting power due to the 4400mAh battery along with massive vapour production at the higher wattage settings, and even at a lower setting of 12w you can expect to experience good vapour production too. A clear bright OLED screen makes reading the information on it easy, helped by the intuitive layout of the functions displayed on it. The iStick 50w has been faultless in its performance during the time I have been using it for the purpose of this review. Being comfortable to hold, solidly built and with no rattling parts, a truly amazing battery life supplying you with 4400mAh of continued vaping pleasure in such a small device it’s clearly quite an achievement on the part of the design engineers, making this a very worthwhile upgrade from its 30w predecessor, and for people considering a new box mod design that allows you to enter the realm of the Sub Ohm Vaping. Output performance with a maximum of 50 watts should also help to satisfy the cloud chasers amongst you producing huge vapour with equally impressive performance all the way down to its minimum of just 5 watts. This little powerhouse has been a dream to use so much so that I intend to include it in up and coming E-juice reviews along with Clearomizer and RBA reviews as well. Both in clearomizer and RBA setups that I have used in the review all have flush mounted and fired first time without any problems or visible gap between their base and the 510 connector being present, which is what I would expect to see on a device of this quality. The positioning of the two air channels is well placed producing more than sufficient airflow as well. And on this note, please be aware that ISmoka will be releasing a V2 of the Lemo RBA sometime in April designed specifically but not entirely to work with the iStick 50w, so keep an eye out for this as well along with a review on its performance for you I hope in the weeks ahead. Expect the R.R.P to be around the £35-£40 mark. One thing that I would like to see added to future releases is the inclusion of a resistance checker display in circular form situated in the same place as that of the iStick Mini, allowing for easy visual checking of your current resistance at a glance. This is an important consideration given the high power outputs that some people use today with our Clearomizers/RBA setups. The position of the fire button allows for a comfortable vaping experience too. And with the button being slightly raised you can find its location quickly, requiring little pressure on the part of the user to activate it. Thankfully due to its position you are less likely to fire it by mistake should you place it down on its side. The iStick 50w allows you on average three day’s vaping time without the need to recharge your battery, and with a recommended retail price of around £45.00 $60.00 on a personal note, I would be inclined to give this some serious consideration when you are looking to make your next purchase. For further details on the iStick 50W and any other ISmoka Eleaf product, please visit their online website or your local brick and mortar stockiest. What is the resistance of the coil you are using and Tank? Try this link to help you determine your desired settings. Resistance = 1.8 Watts a setting of 8.0 watts which will give you 3.79 volts drawing 2.11 amps. As a rule of thumb set your desired wattage in the field provided, along with the coils resistance value to get the voltage setting. or down will reduce it. Hope this helps you. I would only recommend dilbosapse e-cigs to those that are really unsure about making the switch, and want to try something to give them an idea of what it would be like. Since they are dilbosapse, they are not as good, quality wise, as the multi-part systems. The quality could lead some people to write e-cigs off as an option.Infrequent smokers, like those that only smoke when they go out to a bar, might also prefer dilbosapses. They don’t have to be recharged, and the non-rechargeable battery does last longer.Yes, many people prefer the simplicity of the 2-piece e-cig, and gadget lovers may prefer the 3-piece. However, I think that most people prefer a 2 piece system as their first choice, so they can get into it right away. Gadget people can explore other options later. HI, I just wanted to add my two dlorals.I bought my first e-cig at a gas station and had high hopes. I thought I should smoke it like a cigarette. It didn’t work for me at all. It looked like a cigarette, but tasted awful. I thought the concept was good and really wanted to like it but gave it up, and kept on smoking. This was over a year ago.Recently I looked back into it because I’m turning fifty and have to quit. I researched them this time and bought a ego 900 battery with a clearomizer (spelling?) and all I can say is WOW. I’m in love! You are so right about learning a whole knew way of smoking .I mean vaping. Def learning curve, and these things don’t come with instructions. I personally prefer the two part battery and clearomizer as it is very easy to use, and I can mix my own juice, add different flavors and switch them out when I get board, which is even better. I found this article very informative. Personally I love my eleaf battery. The eleaf products have superceded my needs and expectations of what a sub ohm should be. Prior to this devices purchase I continuously broke the piece that connected my tank to the battery until I found the sml eleaf pen in which the connector threads and base piece were welded on. Since I regularly fell asleep with my vape pen it would often break off or come loose damaging the wires. I even caught my pocket on fire. So I found the eleaf pen and it saved me 100’s off $. Now I get a better, very satisfying result from my eleaf 50 w sub ohm. The desired cloud and sufficient satisfaction from vaping. I just want to know the best setting for the eleaf 50 w with the Atlantis 2 tank. I have it set at 3.5 V, 20.4 W and 0.6 ohms. Which is my fave but what would be ideal to increase cloud production? I use isub tank with this, 0.5ohm coil set around 17-22 watts even though coils say 20-35w …. After 25watts tastes burnt but at about 18-20 is bang on. Battery is awesome and lasts well, id get a silicone case though as gives better grip, i also use 80vg/20vg liquid 3mg-6mg nicotene, anything after 12 mg is quite harsh, have airflow half open n inhale for around 3 seconds nice cloud and good flavour too. Also i tried kanger sub mini £25 and aspire triton £40 and had issues, the isub was only £15 and i personally feel is a much more effective simpler design that is far cheaper and better.